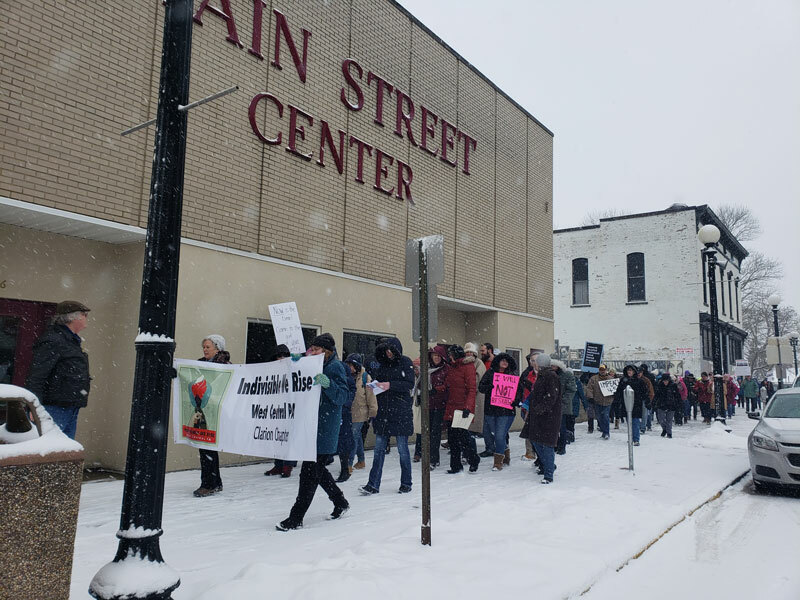 CLARION, Pa. (EYT) – Despite a looming winter storm, the Women’s March in Clarion paraded down Main Street on Saturday. 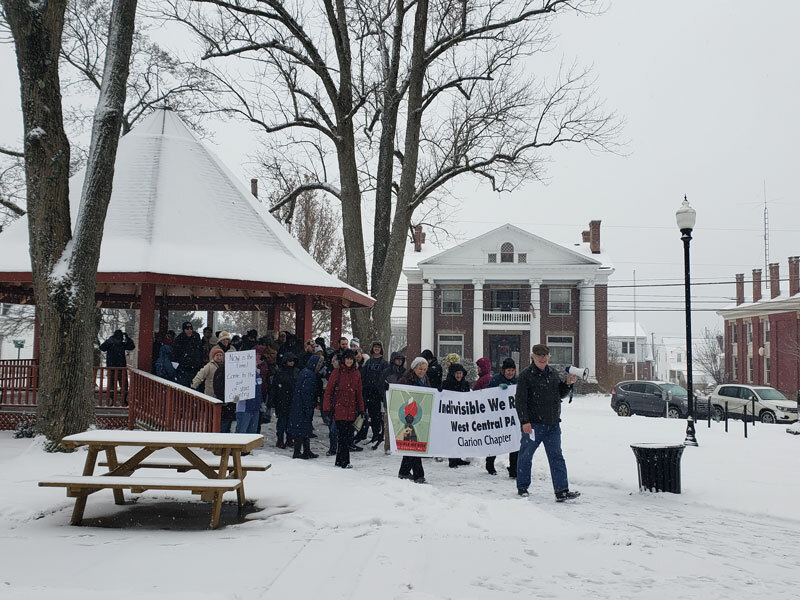 Indivisible We Rise West Central PA sponsored the Women’s March in Clarion in coordination with sister marches in cities and communities across the globe. 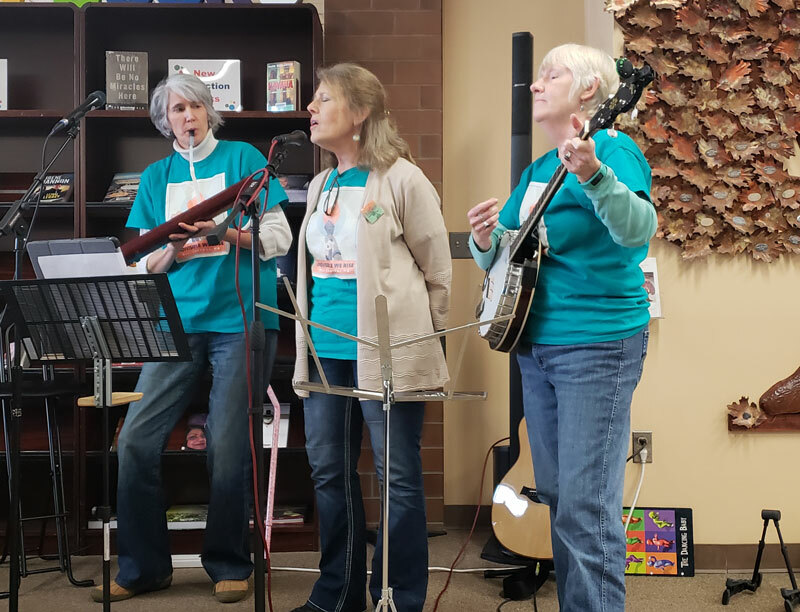 It was held to commemorate the 2017 Women’s March on Washington. 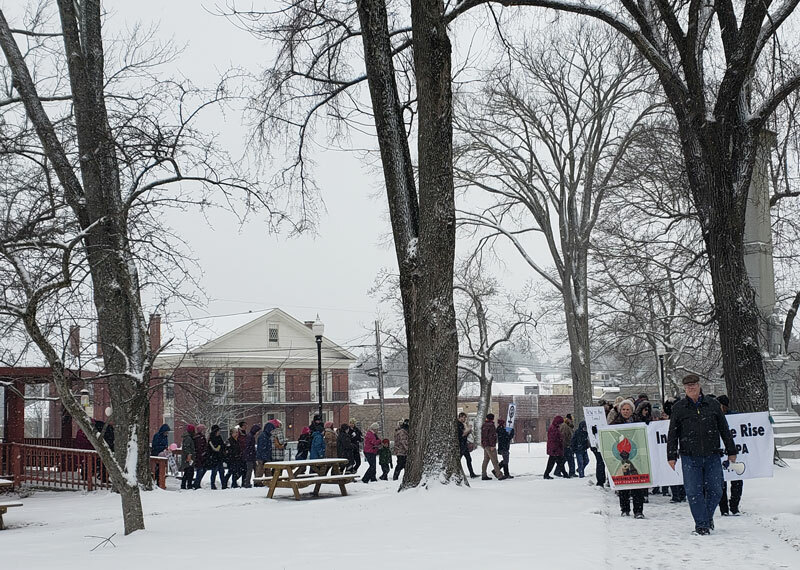 Topics at the Clarion rally included women’s rights, human rights, sexual violence, and related issues. One speaker urged the crowd to contact Congress to urge politicians to take action against the injustice of children being separated from their parents that is still occurring at the nation’s southern border. 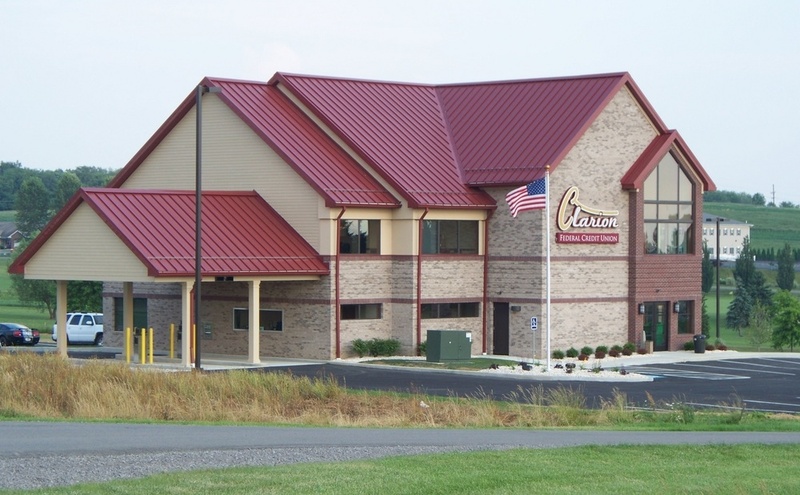 Although the event was somewhat hampered by the impending weather – with keynote speakers Dr. Susan Boser, former candidate for PA’s 15th Congressional District, and Indiana University of PA Sociology Professor, and Dr. Catherine Adams, a board-certified pediatrician and adult-child psychiatrist practicing in central PA, unable to attend – a crowd of around 70 people braved the blowing snow to gather in the gazebo in Veterans Memorial Park. The event opened with a blessing by Rev. Dr. Jonathan Scanlon, Pastor of First Presbyterian Church in Clarion. 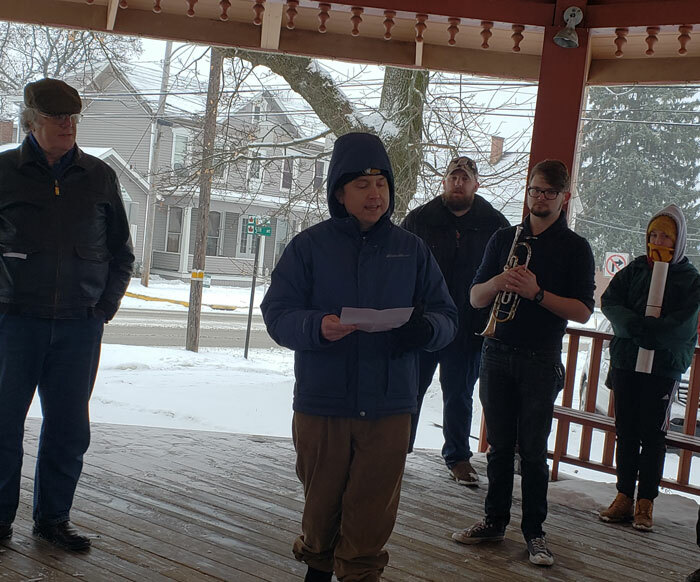 Following the blessing, Clarion Borough Mayor Dan Parker also addressed those gathered. “It really is nice that we can all gather together here today and to celebrate the things that bring us together,” Parker said. 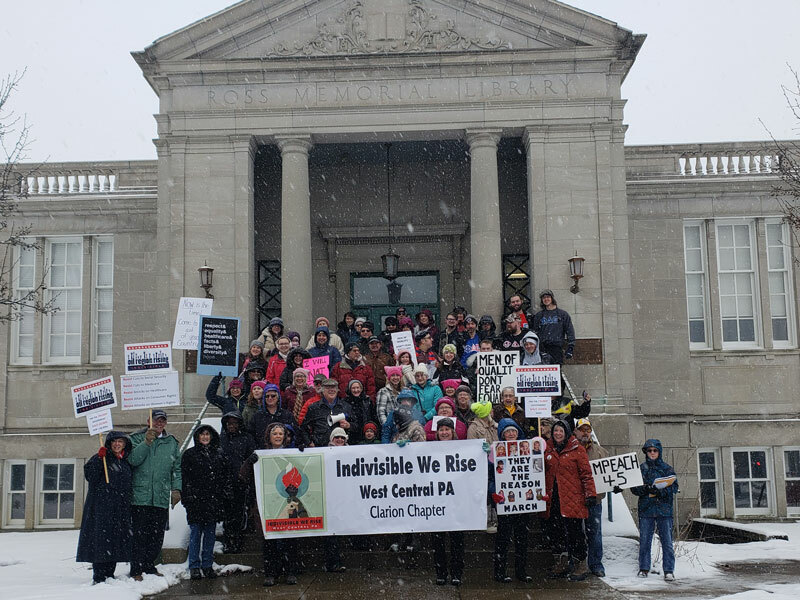 After the opening of the event, the march itself began as those gathered moved from the gazebo and lined up to make their way across town to the library. 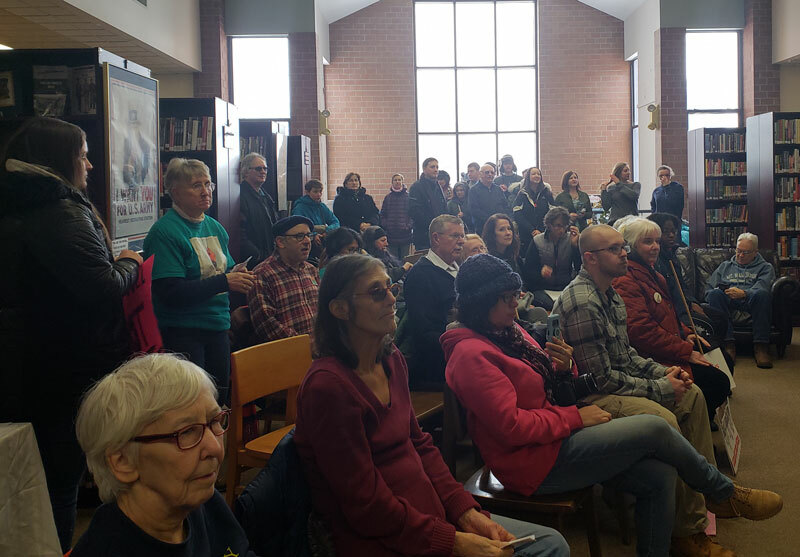 Upon reaching the library, the marchers paused for a group photo before moving inside, where coffee and snacks awaited and the bulk of the program took place. 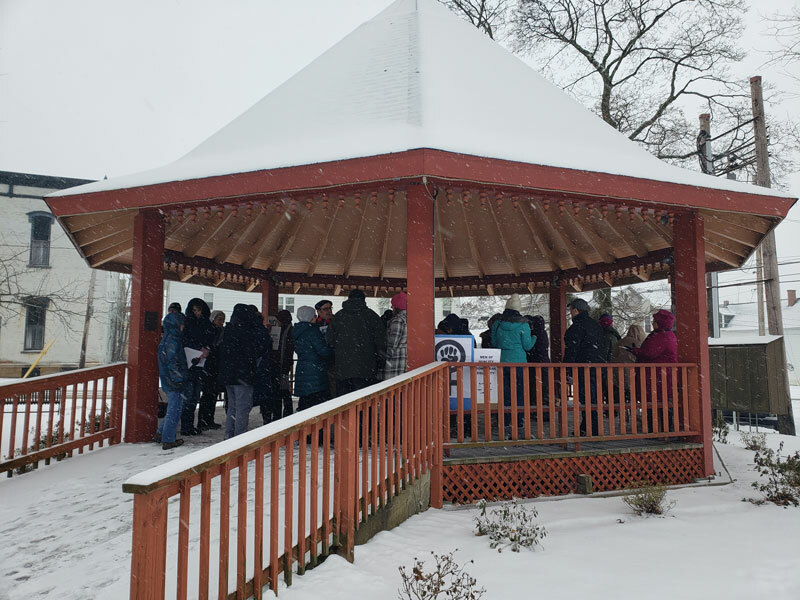 According to organizer Kathy Krouse, they were “stunned” at the number of people who came to the event, considering the weather and the impending storm. 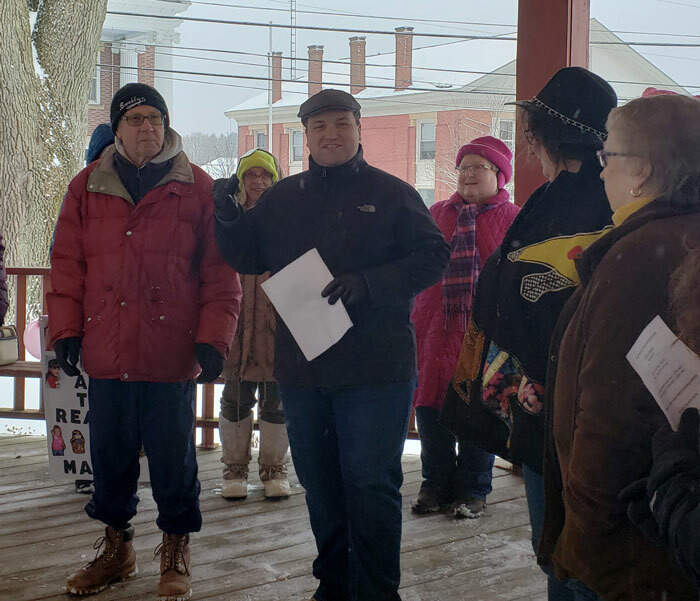 “Only in a community like this would people come out on a day like this to make a stand and make a statement,” Krouse said. 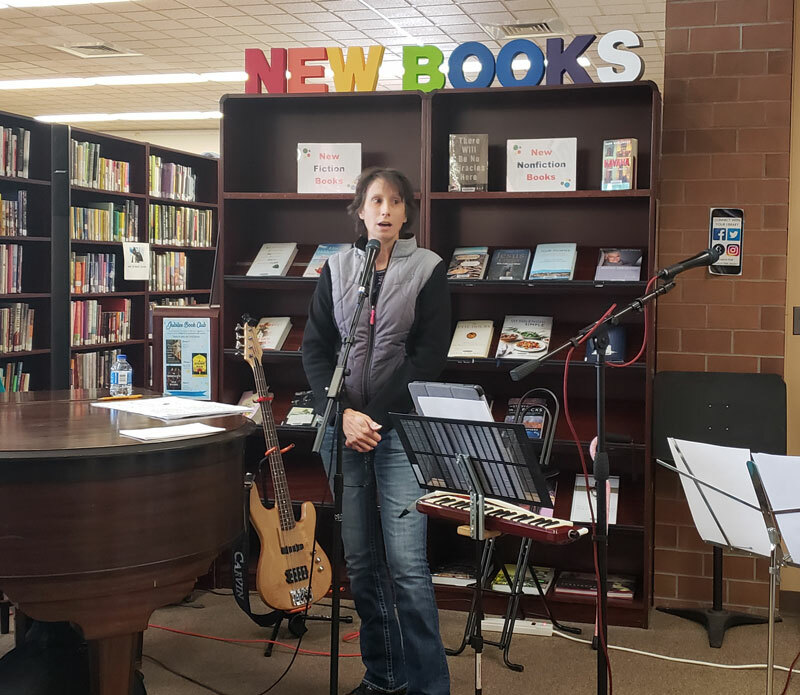 The first speaker for the event was Marlene Austin, the Executive Director for Passages, Inc., a local non-profit that advocates for the needs of survivors of sexual violence and works to eliminate sexual violence through education and promotion of social change. “Conversations around sexual abuse and harassment have been in the spotlight throughout this year due to the rise of the MeToo Movement and the TimesUp Movement, and while these movements are working to bring important changes in our society, they can also fall distant from the instances that are happening right here in our own community,” Austin said. Sexual violence was not the only topic presented during the event. Dr. Janina Jolley, a recently retired Clarion University professor who holds a Ph.D. in Lifespan Developmental Psychology, also spoke about the long-term damage caused by children being separated from their families, in relation to the current separations still occurring at the nation’s southern border. “It doesn’t take an MD or a Ph.D. to know that separating children from their parents is the wrong thing to do and that it has serious and long-term consequences, for not only the children but for the families and for society,” Jolley said. According to Jolley, when a child is separated from their parents in this way and put under the stress of an institutional environment, it does permanent damage to the child. “It makes them less likely, throughout their lives, to be able to control their emotions. It makes them not learn as easily. It actually makes them more susceptible to disease. Children that grow up under stress are more likely to develop obesity, diabetes, heart disease, even Alzheimer’s,” Jolley said. 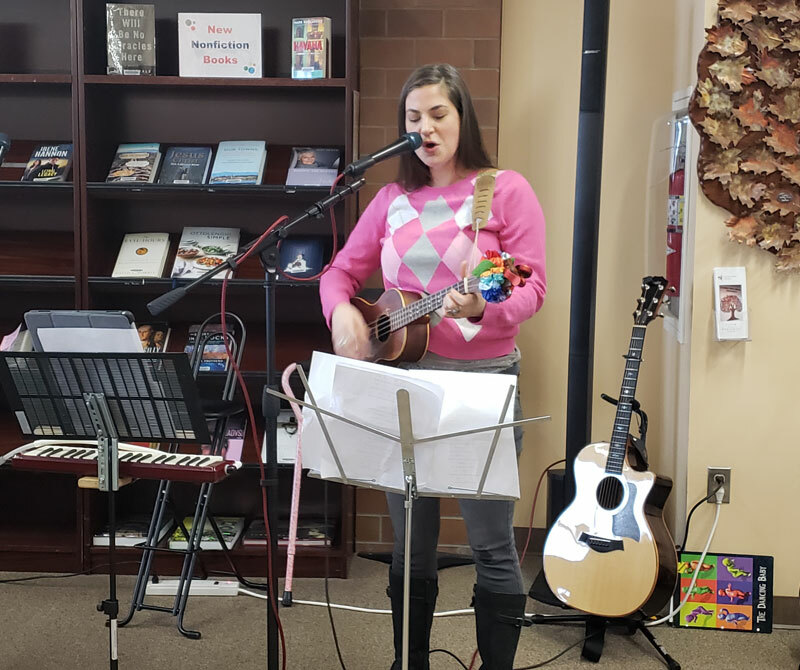 While the majority of the program did focus on women’s right and human rights issues, in honor of this year marking the third annual Women’s March across the nation, and in celebration of the progress made, the event did also include music, with both local musician Samantha Sears, as well as several of the Indivisible We Rise organizers stepping to the mic. The program wrapped up with a final benediction offered by Ann Liska of Clarion University Campus Ministry.